I like to eat cheese. Pasta with lots of cheese. Melted cheese. Nachos with cheese. Roti prata with cheese. But funny enough, desserts with cheese are not my top choice. 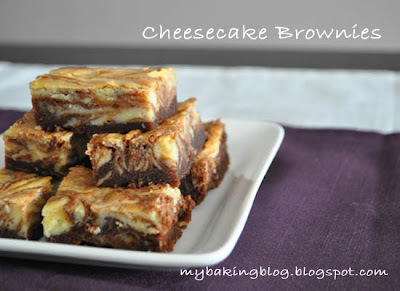 I saw a recipe for these cheesecake brownies and though I should give it a shot, since people who tried it gave it thumbs up. Plus I had to use up the cream cheese I had left from my oreo cheesecake. It was not difficult. Only thing was I did not spread the cream cheese evenly on top, so some slices had more cheese, some had less. These disappeared from my kitchen real fast. If you like brownies and you like cream cheese, then this is for you. The recipe is added here. Firts of all..thnaks for passing by my blog..love your creations..nice neat and visually applealing work. thanks for the nice words, I wish I am half as good as you! I love cheese just as much as you!! :DD These sound and look delicious!!! I love cheesecake and brownies. Maybe you can even make a graham cracker crust and have it be a mixture between a cheesecake, brownies and smores!!! YUM!! Not only is this decadent but it is beautiful.... Great photography and im sure a delicious recipe! Will have to try this out ASAP! Thanks Joudie! Hope you will like it! I can't wait to get to this recipe. My family will love it!